I'm Not Rappaport 1996 - 135 min. 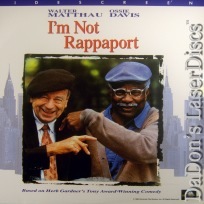 - Color Genre: Comedy Rated PG Country: USA LaserDisc Movie Review: In this screen adaptation of the award-winning play by Herb Gardner (who also directed the film), Nat Moyer (Walter Matthau) and Midge Carter (Ossie Davis) are two elderly men who sit on the same park bench each afternoon and have developed a relationship based on playful verbal sparring. Nat is an eccentric Jewish leftist who uses a dizzying variety of voices and assumed personalities to get his way, while Midge is the African-American superintendent of an apartment building who is afraid that he's going to be put out to pasture, as he's about to turn 80. Nat tries to encourage Midge to join him in his good-natured con games (which are performed for good causes and not for profit), but Midge remains wary. While Midge sweats out a possible retirement, Nat is trying to deal with his daughter Clara (Amy Irving), who wants to put him in a nursing home. Meanwhile, a drug dealer called The Cowboy (Craig T. Nelson) has claimed the park as his own territory, and Nat, impersonating a Mafia don, tries to run him out, while he befriends Laurie (Martha Plimpton), a young woman hooked on dope. --- Mark Deming Watching two old geezers putter around Central Park may not be most people's idea of engaging cinema, but I'm Not Rappaport makes this kind of septuagenarian buddy dramedy tolerable enough. 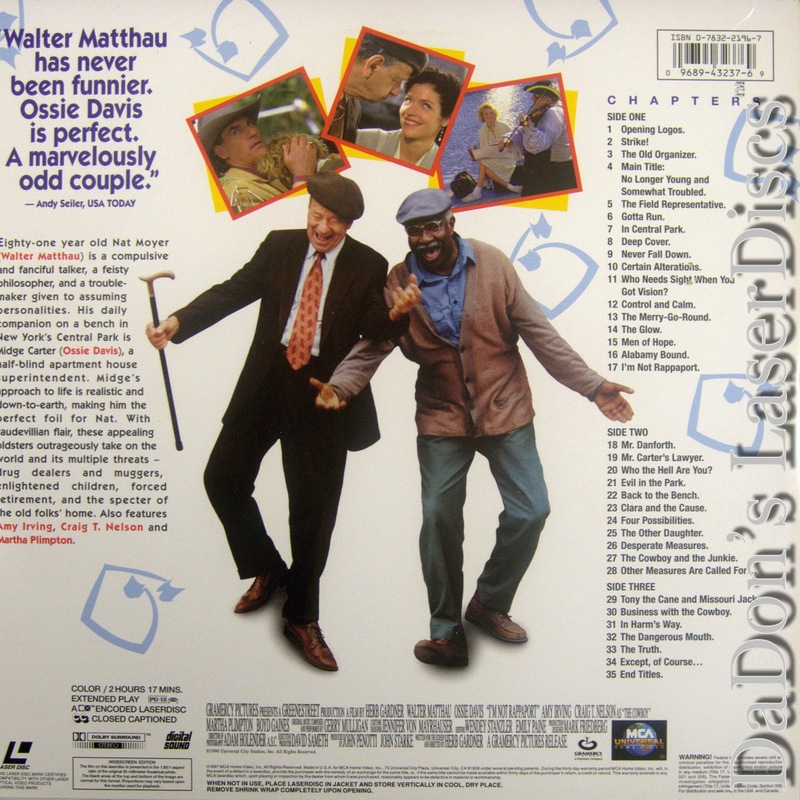 Walter Matthau and Ossie Davis, both pushing 80, prove they still have sharp command of dialogue and humor, so their lengthy conversations don't induce seat squirming as fast as they might in lesser hands. Matthau in particular is fun as an accomplished and compulsive liar, who fragments together plausible personas without missing a beat. Still, Herb Gardner's adaptation and direction of his own play can't overcome the narrow appeal of its subject matter. It's a great showcase for actors usually relegated to supporting roles (or sent out to pasture) by their age, but that's not much of a selling point beyond their immediate families or fan clubs. Matthau's Marxist meddling with a variety of secondary characters feels stagy, and his scenes with his estranged daughter (Amy Irving) are flat and superfluous. Gardner does capture some of the invigorating life force of Central Park, but 135 minutes of it is too much. A two-person character study should clock in at well under two hours, especially when the characters travel in such a slim radius. I'm Not Rappaport is like one of those long, rambling stories told by a grandfather in dire need of attention, unaware his polite audience is bored to tears. --- Derek Armstrong Thanks for Visiting DaDon's Rare LaserDiscs ! Reviews, Articles, Newsletter and Information for Movies on LaserDisc LD Laser Disc, LazerDisc.